Gum disease is very common, what is it and what can be done? Periodontitis is gum disease and begins with plaque build-up around the gum line. Where it is identified by a dentist early on, treatment can be provided to stop the condition to avoid it developing further. But there is no cure. Treatment will include regular visits to the dentist or hygienist, scaling treatment and the use of small inter-dental brushes to attack plaque build-up at the gum line. Without early treatment the bacteria from the plaque build-up can grow and attack the gums, developing under the gum’s surface damaging gum tissue and bone. Research has proven that gum disease affects 15-20% of the world’s population and it is estimated that half the adult population has some degree of gum disease and most people experience it at least once in their lifetime. It is estimated that in the UK, 10-15% of adults have severe periodontitis, with many more being affected by mild to moderate levels. Gum disease often progresses without a person realising they have periodontitis. It is often painless in the early stages, and the symptoms of the infection can be subtle and the signs are often ignored, considered to be irrelevant or perhaps normal. Our dental experts have told us that as well as poor oral hygiene there are other risk factors which may increase your susceptibility to developing gum disease – these include diabetes, smoking, family history of the condition and hormonal changes. Smoking in particular can be a direct cause of the development of the infection. It has been proved that development of the disease can cause a you to develop other health issues such as heart disease and research suggests, Alzheimer’s. What will happen if my dentist misses it? If you have periodontal disease and your dentist fails to diagnose it the infection will continue to develop and attack the gum and jaw bone. Without treatment the disease can, over time, lead to loss of bone in the jaw which holds the teeth in place. Over time your teeth will become loose and may eventually require extraction. As periodontal disease often affects areas in the mouth rather than individual teeth, several teeth can be lost at once as a result of the failure to appropriately diagnose and treat the condition. As specialist Dental Negligence Lawyers we are often instructed to act for clients regularly where their dentist has failed to diagnose and treat periodontal disease. Often the claims that are brought are successful the main element in terms of the compensation awarded represents the going and expensive future dental treatment required as a result of the dental negligence. Often money is awarded to pay for treatment such an implants where teeth have been or are going to be lost and on-going maintenance treatment to prevent further tooth loss. As an example, a client of mine was recently awarded £35,000 when her dentist negligently failed to diagnose her advanced periodontal disease. Her compensation reflected the pain and suffering she endured as a consequence, and the remedial treatment she required to put things right. Other similar cases can be viewed on the “Recent Cases” section of our website. Essentially it is your responsibility to ensure a good oral hygiene routine is maintained everyday, and to notify your dentist of any symptoms you are concerned about. Did you know that the new advice is to brush twice-a-day and at least one other time during the day? But it is your dentist’s responsibility to monitor your periodontal health during regular dental check-ups and to provide you with appropriate diagnosis and treatment for gum infections where they develop. 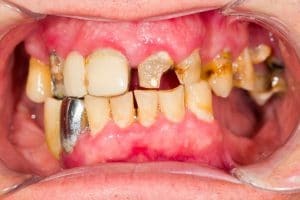 If you have been diagnosed with gum/periodontal disease which you think your dentist should have diagnosed earlier, you may have a claim for Dental Negligence and it is important to seek specialist advice to ensure your treatment is fully investigated and compensation achieved for your future treatment requirements.